December 18, 2017, Santo Domingo, Dominican Republic – Historical traditions and hope for the future were combined in an exuberant way December 16 as Sister Xiomara Méndez-Hernández, OP, made her Perpetual Profession of Vows with the Adrian Dominican Sisters. The Mass was at the Dominican Convent in Sister Xiomara’s hometown, Santo Domingo in the Dominican Republic. The traditional Dominican rite involves only explicitly the vow of obedience. 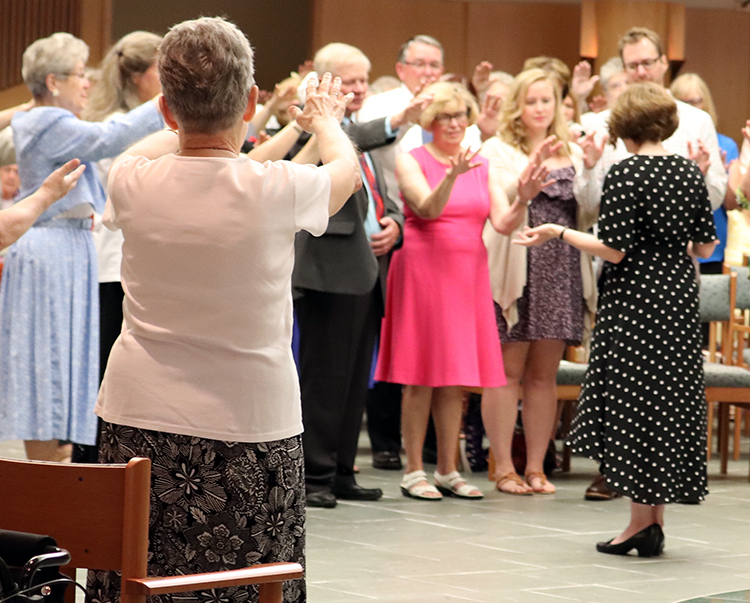 The other two vows traditionally taken by people in religious life – poverty and chastity – are explicitly stated in the Adrian Dominican Constitution, by which professed Adrian Dominican Sisters promise to abide. 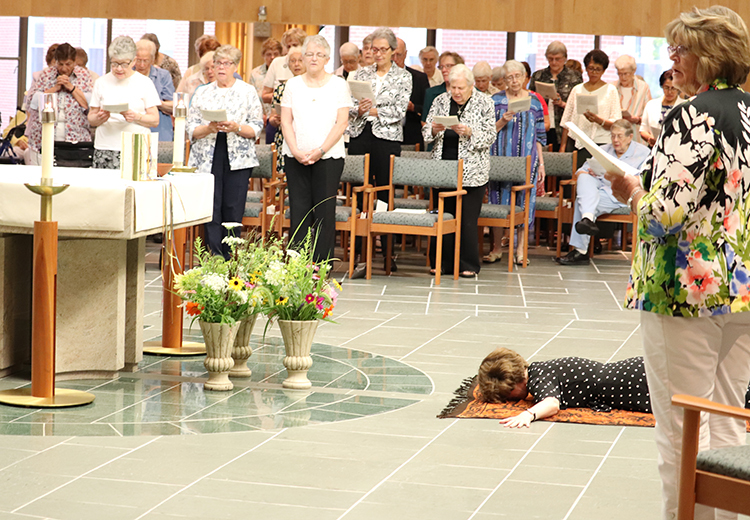 The Rite of Profession also included the Prioress’ call to Sister Xiomara; a formal examination as to Sister Xiomara’s readiness for perpetual vows with Sister Kathleen Klingen, OP, her Chapter Prioress; the sung Litany of St. Dominic, while Sister Xiomara lay prostrate in front of the assembly; the blessing and presentation of Sister Xiomara’s profession ring; and the signing of the profession documents. 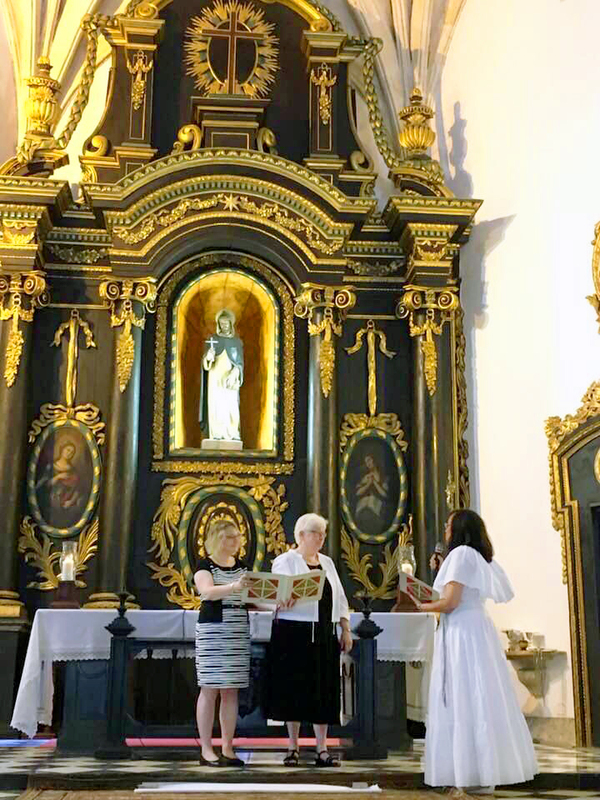 Sister Lorraine Réaume, OP, Formation Director, left, and Sister Patricia Siemen, OP, center, Prioress, begin the Rite of Profession of Vows with Sister Xiomara Méndez-Hernández, OP, in the 1510 Dominican Convent. Sister Lorraine Réaume, OP, Director of Formation, welcomed the assembly, and Sister Marilín Llanes, OP, who lives in community with Sister Xiomara in Chicago, offered a reflection. 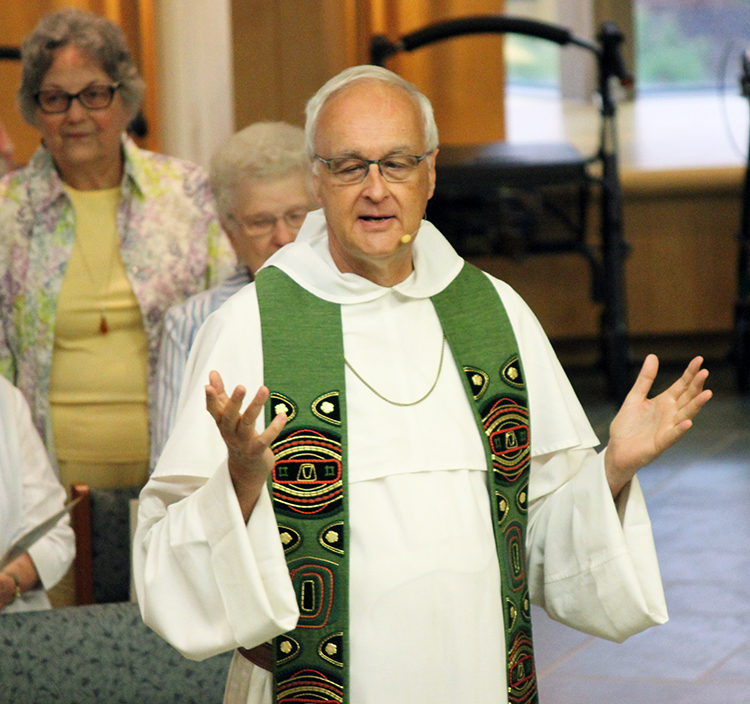 The liturgy was celebrated by Father Cristóbal Iglesias, OP, and concelebrated by Father Martin Edward S. Ohajunwa. Sisters Basilia De la Cruz, OP, and María Eneida Santiagao, OP, were her witnesses. Sister Rosa Monique Peña, OP, who serves in formation in the Dominican Republic, was the Master of Ceremonies. 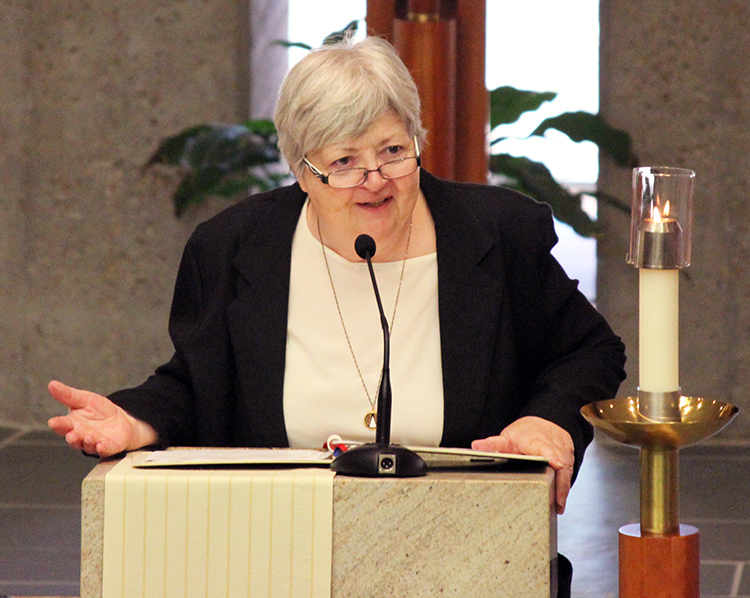 Sister Mary Jones, OP, served as cantor. Sister Jeanne Wiest, OP, played the clarinet, and Aracelis Mena, a dear friend of Sister Xiomara, was the photographer. Born in Santo Domingo, Sister Xiomara studied fashion design and received a bachelor’s degree from Universidad Autonomo de Santo Domingo in 1999. From 2004 to 2008, she had her own fashion design business, Xissors Couture, in Santo Domingo, and from 2006 to 2008 also taught fashion design at Instituto Nacional de Formación Técnico Profesional (INFOTEP) in Santo Domingo. She also served on a national board for certification of professional patterns and sewing. Sister Xiomara was one of seven women from the Dominican Republic to become Adrian Dominican Associates in 2004. Associates are women and men – at least 18 years of age – who make a non-vowed commitment to partner with the Adrian Dominican Sisters while maintaining their own independent lifestyle. 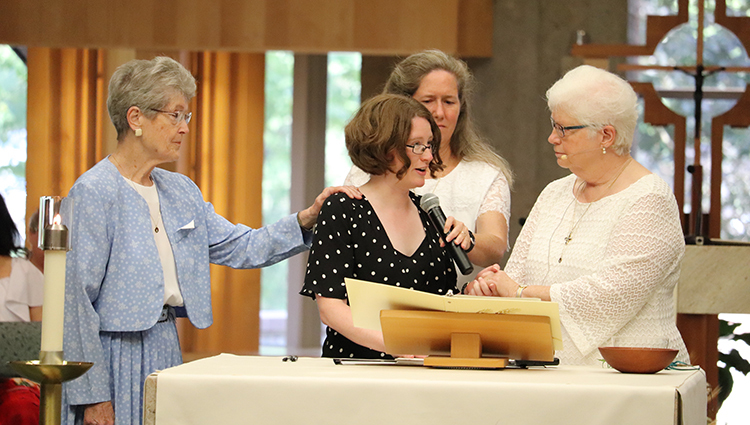 Sister Xiomara entered the Congregation in 2008, undergoing a discernment process to determine if she was called to life as an Adrian Dominican Sister. 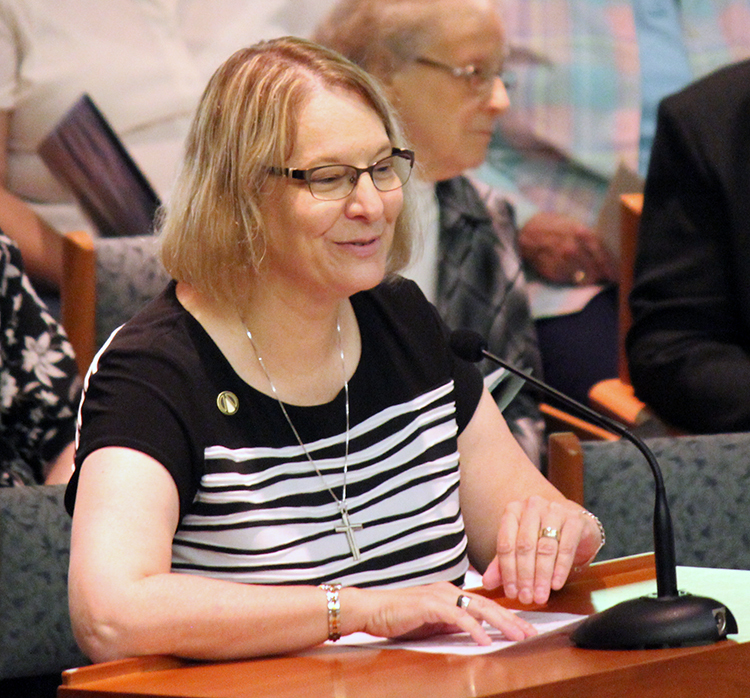 She took part in Clinical Pastoral Education (CPE) training for chaplaincy at Loyola University Medical Center, Chicago, in 2011-2012 and earned a Master of Arts in Pastoral Studies (MAPS) from Catholic Theological Union in Chicago in 2014. Sister Xiomara served as chaplain at Dignity Health-St. Rose Dominican Hospitals in Henderson, Nevada, from February 2015 through March 2017, when she began her current ministry as chaplain at Loyola University Medical Center in Chicago. 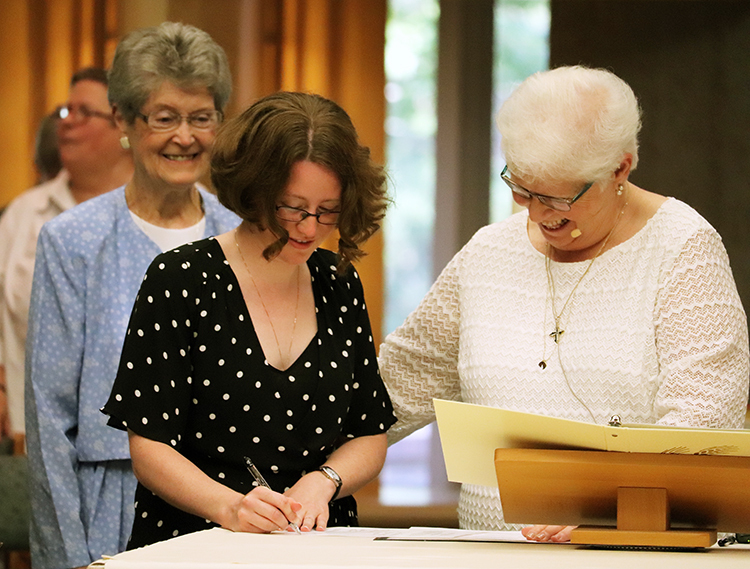 Feature photo: Sister Patricia Siemen, OP, Prioress, left, and Sister Xiomara Méndez-Hernádez, OP, show their great joy after Sister Xiomara’s Perpetual Profession of Vows. Left: The assembly blesses Sister Xiomara at the closing of her Final Profession.